ItemB-07228 - "General View, Revelstoke BC, Taken June 28, 1897." ItemB-07241 - "The Pend d'Oreille River Plunging into the Columbia, Boundary Washington." ItemB-07244 - "Nanaimo from the harbour, Steamer Joan starting on her daily run." ItemB-07266 - "50 horse pack train leaving Quesnel BC with supplies for Yukon Tel." ItemE-08449 - The Metlakahtla Marching Band, under a welcome arch. ItemF-01941 - "Grouse Mountain Chalet." ItemF-02481 - "Hotel Vancouver, Vancouver, B.C." Item B-07266 - "50 horse pack train leaving Quesnel BC with supplies for Yukon Tel." 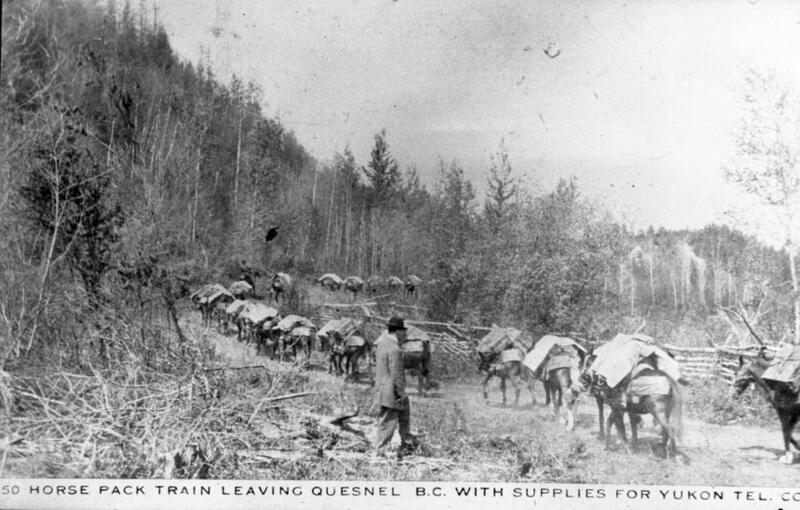 "50 horse pack train leaving Quesnel BC with supplies for Yukon Tel."